Discover businesses and farmers across the prairies. Find certifiers, retailers, seed cleaners, and all those in between, or connect with farmers selling the products you are searching for. 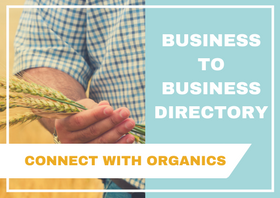 The Business to Business Directory lists all companies that provide services or products and connects thousands of organic businesses together – from producer, to end retailer. Check your listing to ensure all information is correct, or if you don’t already have a listing, simply fill out the form and send it back to us. Basic listings are free! Want to really get noticed? Upgrade your listing and ensure you get called first. Don’t miss this opportunity to promote your business! Update your listing today! Click here to download the farm listing order/update form, or click here to download the company order/update listing form. Submit your form to info@prairieorganicgrain.org.